Sadly, home invasions have become so common that they are old news or generally acknowledged as inevitable. Even if you have a monitoring security system, the response times of the alarm companies and even authorities can be delayed, rendering them inefficient and useless. 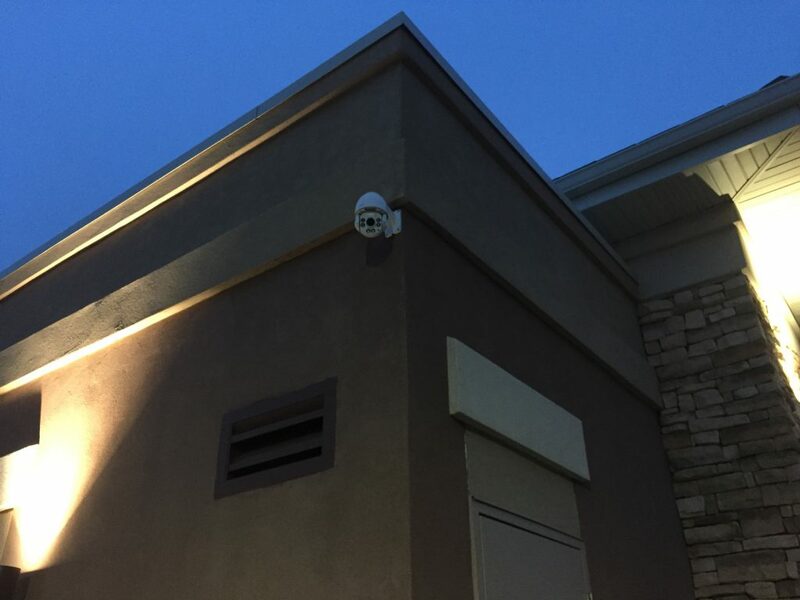 A PTZ security camera installed at a vet hospital in Colorado Springs. This camera be controlled remotely. What are some practical solutions? Lights! Camera! Action! The biggest deterrent during a break-in is to expose the perpetrator. All of your lights being triggered – along with adequate flood lighting – exposes the invader and makes him vulnerable. Because the authorities’ response time may not be quick enough to apprehend the perpetrator, cameras are an essential way to help identify the culprit. In most cases, if the perpetrator sees a wireless security camera system, he will move on to easier targets. So lights, camera, now… action! Alarm sounds confuse and disorient the potential invader, giving you valuable time to get your family to safety as well as alert the neighborhood for additional awareness and help. Our wireless security camera systems are easy to install and affordable. They can be viewed remotely by you, anytime, anywhere. You can easily have settings for when you are away from home, for any length of time – daily, short vacations, or for extended periods. We have tailored our home security systems in Colorado Springs to cater to all your security needs. It is truly amazing how innovative your home can be! But how can we get all of these various aspects of our home to work together rather than having them all be separate aspects with different functions? Home Automation does all the work for you. As you pull into your driveway, the sprinklers and water features have automatically been timed, along with your yard and security lighting that only comes on when necessary, or at a time of your choosing. You open your garage and, if it is dark, the lights come on and the doors automatically unlock and re-lock behind you. You go inside to be greeted by your great kids, who were let into the home automatically after school at specified times, because the home is programmed to recognize the kids’ unique codes or fingerprints, subject to your guidelines. You know they made it home safely because you were alerted on your mobile device as to who entered your home and when. The kids head out to enjoy the self-monitoring pool in the backyard. Tonight, you and your significant other will enjoy using the outdoor kitchen with the heaters and fans so you can be comfortable in any weather condition. But, for now, you push a button to put the house into the mode that best suits you… soft lighting, smooth jazz, a gentle fire, and your bath begins filling at the perfect water temperature. The entertainment center is set to the news or sports, the computer turns on, and the furnace kicks on. Later, as the house settles down for the night and your shades automatically close, you can rest easy knowing the house is secure with automatic temperature, gas and smoke monitors, automatic locks, automatic flood lighting, continuous cameras and triggered alarm sounds. In a nut shell, you can rest assured knowing our high quality home automation systems in Colorado Springs are taking care of you. This is the home of today. The sky is the limit with home automation in Colorado Springs. Each family has its own unique needs and desires, and it is our privilege to make life easier for you. Our installed processes are efficient and easy to maintain. These affordable systems save you time and money! Check back with our site as our corporation is always expanding and offering more services, deals and quality products, plus great time- and money-saving tips! Like us on Facebook, Twitter, LinkedIn, and check out our blog.